I wonder when the FPS genre will cease to be the flavour of the month in this industry of ours. Over the years, different genres have enjoyed the spotlight, then taken a backseat, popularity moving in constant flux with modern trends and fickle tastes. Related reading: An interview with the developers of E.T. Armies on making games in Iran. Luckily, in this day and age, most ardent players can appreciate all types of games, be it platformers, survival horror, roguelikes, RTS, twin stick shooters, beat-em-ups, dating simulations, and even take-photographs-up-girls-skirts open world adventures. If you like it then chances are you will find it somewhere on Steam, PSN, Xbox Live, Nintendo eShop and so on. When it comes to gaming, everything old is new again. Despite all this, one still can't get away from the fact that FPSs take up a huge portion of mindshare, for better or for worse. At the end of the day, as an industry and a community, we really love shooting dudes in the face. E.T. Armies is one such game that aims to do the shooty shooty bang bang thing well and it does so with a surprising degree of confidence and panache, albeit on a much tighter budget than your traditional AAA blockbuster. Published by Merge Games and developed by Iranian developer Raspina, it's a small miracle that E.T. Armies was released in the west at all. Due to trade sanctions being lifted against Iran by the west, Raspina are now able to release its games in western markets. E.T. Armies' forthcoming Steam release is a direct result of the recent lifting of those sanctions which is great news for the global games market and the future of Iranian game development; if this is what an Iranian indie studio can come up with on a tight budget, I'm excited at the prospect of what these guys can come up with in the future given a bigger budget and a little more experience. Now, I want to nip this in the bud nice and early; E.T. Armies is a terrible name. It makes me think more about Steven Spielberg's little bug-eyed dude - you know, the one who wanted to phone home all the time - and less about intergalactic space war. It's a bone-crushingly uninspired name that does not do the game justice. Additionally, I wish I could stop there and wax wondrously about how awesome the story and narrative of the game is... but sadly, the story is mediocre at best, and is merely a wobbly hook to hang the solid and engaging action upon. Set in a dystopian future where Earth's resources have been depleted, the majority of mankind have been forced to abandon their home planet in a last ditch attempt at survival. The humans that have abandoned Earth, in search of pastures anew, are referred to as the Parsis. However, those left behind have grown bitter and resentful of the Parsis and have united in their lonely struggle on a barren planet devoid of hope. Those left behind are referred to as the Forsaken and these guys are seriously pissed at the Parsis for leaving them high and dry. You fight for the Parsis, in their bid to vanquish the Forsaken's vengeful insurrection. It's a shame not more is done with the narrative really. I was expecting a little more depth, as I feel the world the game creates is ripe for a compelling political allegory of East and West, though sadly that doesn't really come together in a coherent way. Instead, E.T. Armies treads fairly familiar and safe ground that has very little in the way of surprises. It is, however, delivered with confidence through some decent voice acting, though the script would have benefited with a once over from the writers. Essentially, the story is pretty bland and forgettable and is merely a reason to shoot dudes in the face and blow up low-flying spacecraft with remote airstrikes. Hey, if Call of Duty can get away with it, why can't a game with a fraction of Activision's budget do the same? Thankfully, the shooting and the action is really tight and is doled out at a satisfyingly ample clip; this is undoubtedly where the game shines best. It's an old school run-and-gunner at heart though I guess it's closest genetic comparison would be something like Sony's flagship shooter Killzone, mainly due to E.T. 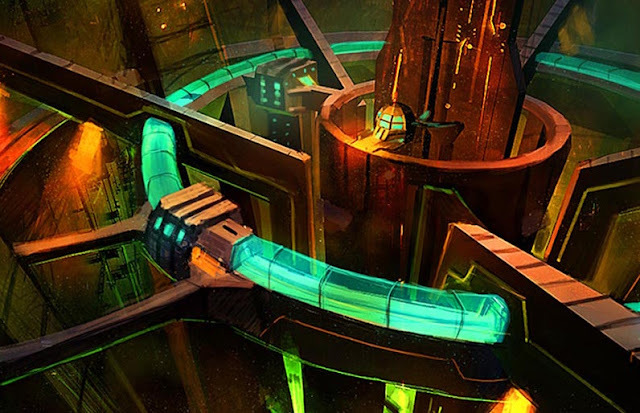 Armies' gritty, rusty colour palette that really feels inspired by Killzone's Helghan world. 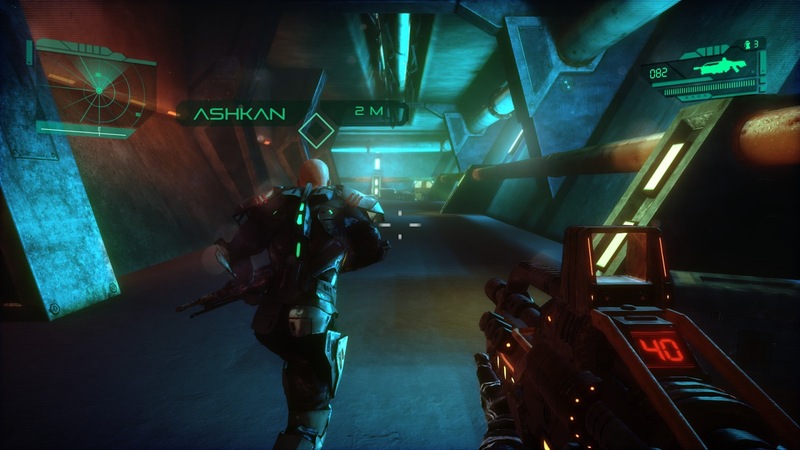 It's not only its colour palette, however, that is similar; the lighting, the emphasized lens flare and the futuristic sci-fi setting and narrative share a lot in common with Guerilla's top-tier shooter franchise. As you may expect from an indie, budget FPS, there are some hiccups that disrupt an otherwise entertaining and rollicking ride. Those, like me, who favour a controller over a mouse and keyboard setup will have to devise some workarounds for the game to control smoothly. Most of the basic controller functionalities do work, however, I had to get used to reloading my weapon by pressing the "R" key and run by pressing "Shift" which was far from ideal. I did try to change the settings to make it a more comfortable, seamless experience, though, sadly I was unable to bind any of my controller buttons in the game's controller menu. I'm sure that there is a 3rd party app that I could download or I could wait for a patch, but at the end of the day I've got to review what is in my hands here and now. Unfortunately, these seemingly avoidable missteps did detract from what is a mostly enjoyable experience. A few hours in, I ditched the controller and played the rest of the game with a mouse and keyboard which wasn't a big deal, but is not my controller input of choice, especially for FPSs. There is also some noticeable screentearing here and there, some stiff character models and no real lip-syncing to speak of. You can see that Raspina have put most of their resources into the tight, fluid combat of E.T. Armies as the cut-scenes are unquestionably budget and fairly dreary on the eyes. 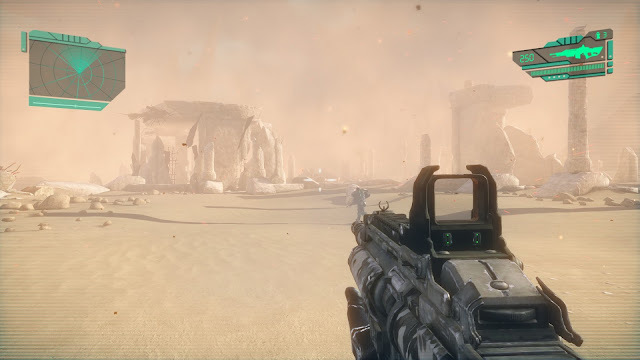 The environments, however, are wonderfully realised with weather effects spattering your HUD, open wind-swept deserts filling the horizon and dank industrial complexes glistening with precipitation. E.T. Armies may not be a looker when the cut-scenes unfold, but it's pretty damn impressive when it comes to the moment-to-moment gameplay and its well-designed eye-catching aesthetic. It also sounds bloody great too, with an epic, rousing orchestral score that helps to get the blood pumping as the you get to work with the blood spilling. Related reading: Killzone is the series that inspired this game the most. 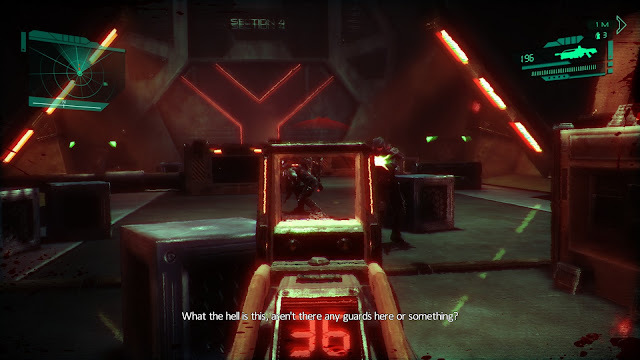 Nick's review of Killzone 4 on PlayStation 4. E.T. Armies is a well-made indie FPS with a few caveats that occasionally detract from a mostly enjoyable experience. The narrative is pretty forgettable and the lack of controller options may put some unsuspecting players off, but the moment-to-moment gunplay is the real draw here and it shines through brightly. If you're in the mood for some mindless, albeit budget, action then E.T. Armies has got you covered. If only it had a catchier name.